The story thus far: Dante, a poet and town prior in Florence, finds himself on a dark road of the soul. Before his spirit can fall to its ruin, he encounters Virgil, the greatest poet of classical Rome. Virgil, at the behest of Beatrice, a woman who was Dante's inspiration in life, offers Dante a journey through the realms of the afterworld, through which Dante may find his soul's salvation. He shall travel through Hell, Purgatory, and Heaven, with Virgil as his guide through the first two. Dante accepts Virgil's offer, and they embark. After passing through the gates of Hell, they encounter the souls of the cowards who took no stand in conflicts between good and evil, and then proceed to Limbo, the realm of the noble or innocent souls who were not baptized or otherwise not believers in the Christian faith. Dante and Virgil then travel to the first circles of damnation. The first is reserved for the lustful, the second holds the gluttonous, and the third holds those who hoarded or squandered their money. After crossing the swamp known as the Styx, which holds the wrathful and the sullen, Dante and Virgil come to the gates of the city of Dis. The residents refuse them entry, and divine intervention is required to open the gates. 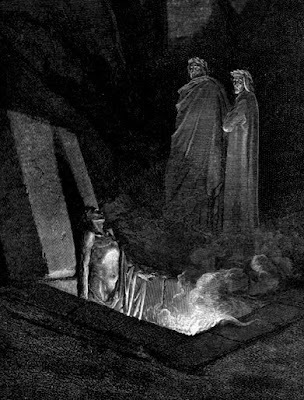 Once inside, Dante and Virgil come across a mock cemetery that holds the souls of the arch-heretics, who believe the soul dies with the body. There is my master, and I behind him. Speak to me and satisfy my longings. With the bodies they left above. For whom the soul dies with the body. My heart in order to speak little to you. May it please you to tarry in this place. Frightened, a little closer to my leader. And he said to me, "Turn around! What are you doing? See Farinata there, standing up straight. From the waist up you will be fully able to see him." I had already fixed my eyes upon his. Seeming to hold Hell in contempt. Saying, "Make your words count." Asked me, "Who were your elders?" Whereupon he raised his eyebrows a bit. To me, my forebears, and my party. As such, I routed them on two occasions." the first and the other time," I replied to him. "But yours have not learned that art well." A shade, from the head up, alongside him. I think it had risen upon its knees. He had to see if another was with me. Where is my son--and why is he not with you?" I replied, "I did not come by myself. Whom perhaps your Guido had held in disdain." Had already told me this man's name. As such, my reply was quite full. Did you say? He had? Isn't he still alive? Doesn't the sweet light fill his eyes?" He laid down, falling back, and showed himself no further. I remained, did not change expression. He neither moved his neck nor bent his back. That torments me more than this bed. When you shall learn how much the burden of that art weighs. Against my own in each of their laws?" Have brought about such declarations in our assembly." Then, having sighed, he shook his head. Without reason would I have engaged in that with the others. I was the one who openly championed her. That has preoccupied my thoughts here. What time brings with it in advance. Although in the present, you have another tendency. The Supreme Ruler still shines this much upon us. We know nothing of life in the world above. That his son is still among the living? To tell me who was there with him. He said, “More than a thousand lie here with me. About those words, which seemed hostile. And I answered his question. “And now pay attention here.” And he raised his finger. That even there was foul from its stench.